Linksify has announced that it has raised half a million dollars in seed funding from entrepreneur / angel investor Jon Fisher and the startup’s founder Tony Wu (a former business associate of Fisher). The company is also launching its contact information sharing tool in beta today. Billed as the ‘last address book you’ll ever need’, the service – which looks and feels remarkably like it was built in the late nineties – promises to give its users complete control over how their information is shared all while respecting their privacy needs. It does so by giving registered members the option to divide people you know into three groups (acquaintances, personal contacts and work contacts) and assign different sets of permissions to them. Once you’ve connected with someone on Linksify, you supposedly never have to update your address book with their contact information again, because it will automatically be modified when the user changes any details. This of course is nothing new and something most people have come to expect from any contact management tool, but Fisher apparently liked this and other features so much that he quit business social network LinkedIn for it. In the free version of Linksify, you can have your contacts from either your Google / Gmail, Microsoft Outlook or Yahoo account synced to your Linksify profile. If you want to sync multiple address books or have the app sync to your iPhone, Windows Mobile device or BlackBerry, you’ll need to cough up $49.95 a year for a premium subscription. Passkeys are semi-private codes that you select and then distribute or share with people you know. 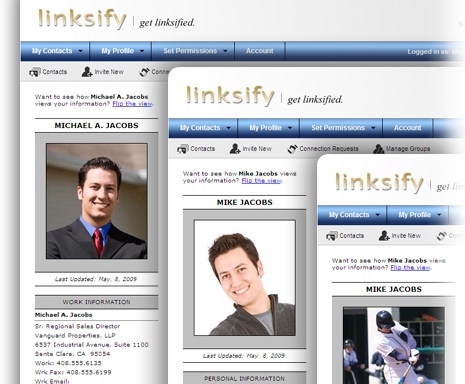 By providing your Passkey to someone, you are giving him or her an advance acceptance—or “pre-approval”—to connect with you on Linksify and view your selected contact profile. Tony Wu, who started Linksify, was the former CFO of Bharosa, which was co-founded and led by Jon Fisher. Bharosa, an online identity theft and fraud detecetion company, was acquired in July 2007 by Oracle, where Fisher stayed on as VP until shifting his attention to angel investments.